Blotit is bold and beautiful, WooCommerce ready, clean style blog / magazine WordPress theme included with superior post listing layouts with various designs. Its 100% responsive, retina ready WordPress theme bundled with visual composer drag n drop page builder (worth $28), slider revolution (worth $18), Layer slider ($17) and Kakapo custom sidebar plugin (worth $16) at absolutely free of cost. Built using twitter bootstrap 3 front end framework, HTML5 / CSS3 valid WordPress theme supports parallax background images / videos. 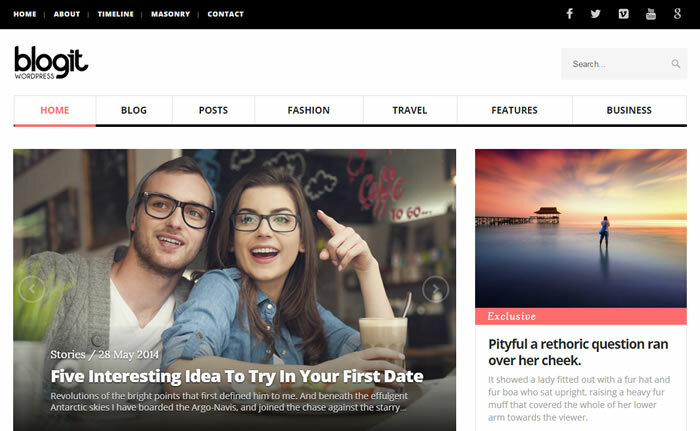 Blotit magazine WordPress theme is child theme compatible WordPress theme supports unlimited sidebars and assign them globally or specific post or page. Its cross browser compatible, search engine friendly WordPress theme included with various post, page, portfolio templates. Enabled to support 600+ google web fonts / Typekit fonts, 400+ font awesome icons along with handy shortcodes and built in contact form page template. Build RTL language website with blogit is so easier using WPML multilingual WordPress plugin and setup demo website with bundled XML file is just a click away.